This month we are going to focus on the art of creating layers and the girls are sharing their tips, tricks and not one, not two, but FOUR tutorials on different versions of layering. Enjoy! Hello Finnabair friends. 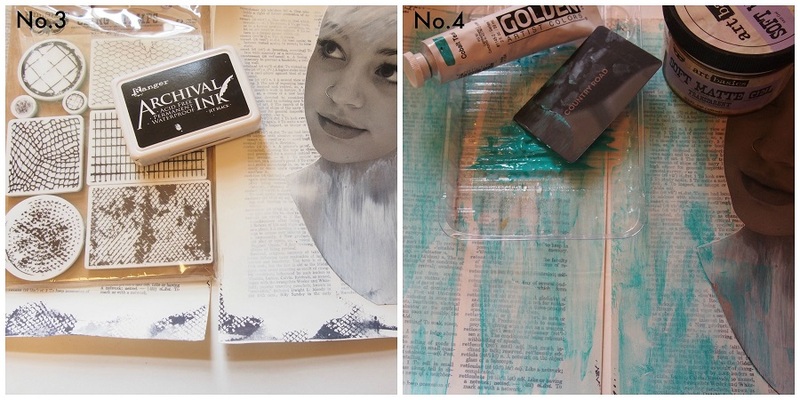 For this months SYWA project on layers, I have made a journal page using layers of “wet mediums”. There are so many wonderful mediums on the market now that you can use to create multiple layers of texture and colour. The only thing you need to be aware of is if the medium is waterproof. A lot of these mediums are waterproof once they are dried and “set” with a heat tool, and will not run, bleed or smudge when other wet layers are applied over the top. 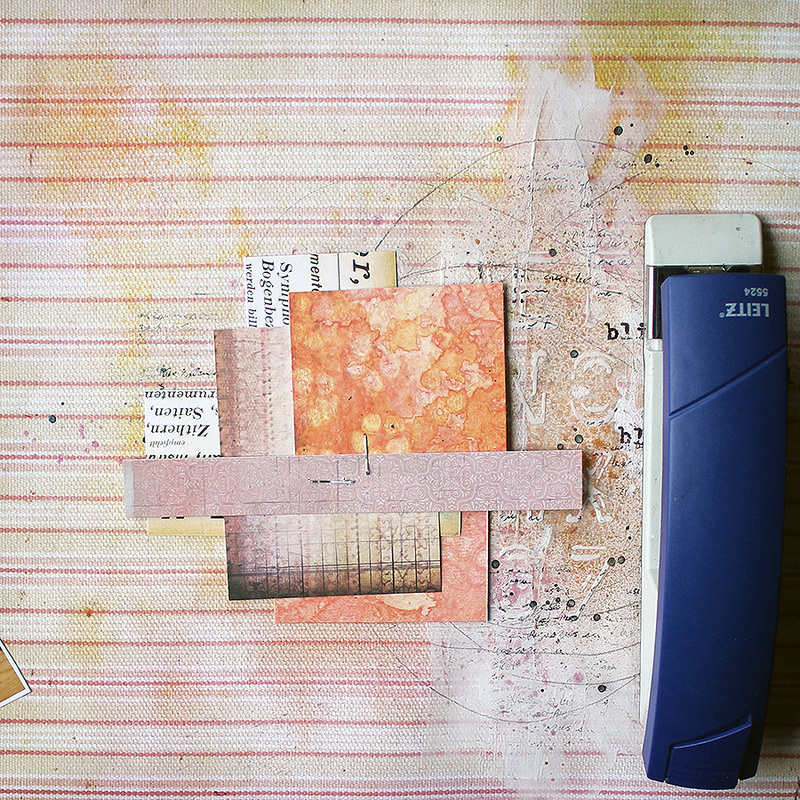 Read the labels carefully and practice using the medium on a piece of scrap paper first! 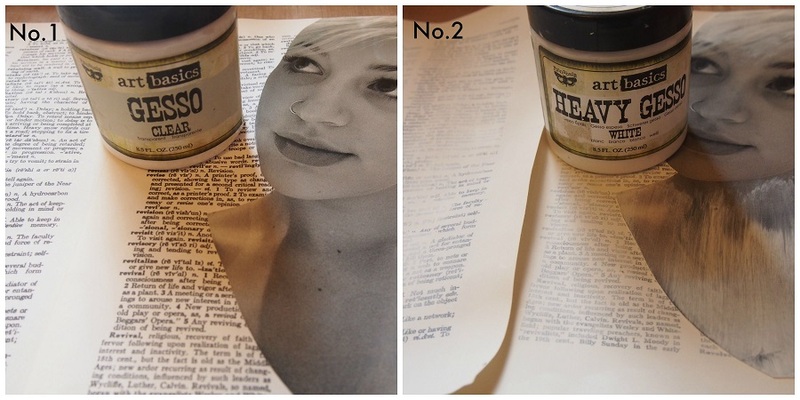 Started with book pages and a photo. Coat the photo with Clear Gesso. This creates a surface on the photo that will accept other wet mediums like paint or ink but at the same time it protects the surface if you splash something on the photo and you are quick, you can remove it with a baby wipe. Except alcohol ink. Then coat the book pages and parts of the photo you may want to add colour to with White Gesso. 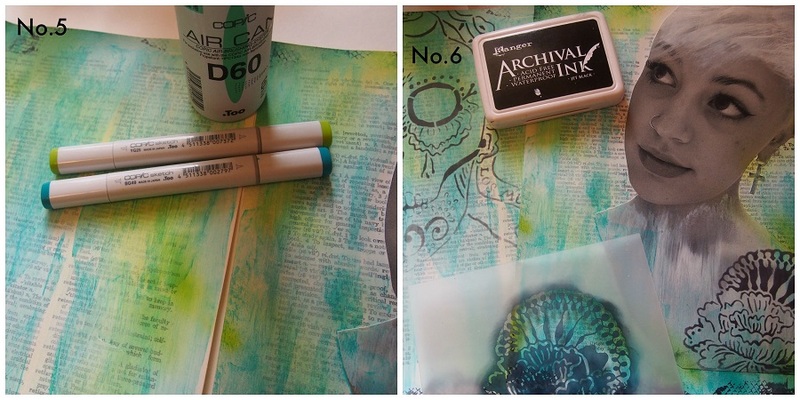 Stamp around the edges with archival ink. 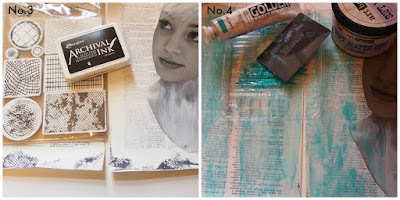 Add a transparent layer of colour with acrylic paint thinned down with Soft Matte Gel. Apply with a credit card or spatula. Copic markers are filled with alcohol ink. Using the small can of compressed air you can buy with the pens, I misted over my pages with another layer of colour. You could of course use any spray mists here, just ensure you heat set them. Next step - archival ink applied through a stencil. 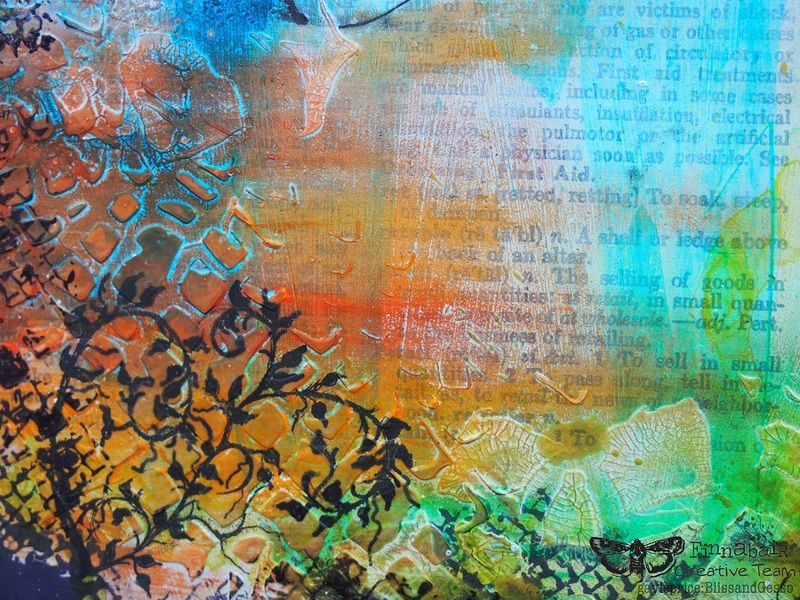 Using Elementals Lace stencil and White Crackle Texture Paste, some texture is added to the page. 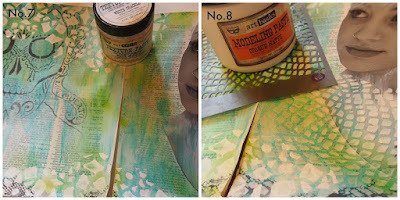 A second stencil - Ripped Fishnet - is added this time using Modeling Paste. Now some bolder, stronger colour using Distress Spray Stains. 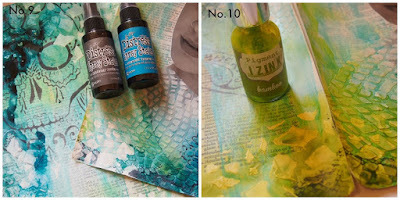 I love the versatility of these stains. You can get some beautiful effects because they will react with water but once dried and heat set, they will not move. Added some even richer colour with Izink pigment ink. Again will react with water but is permanent once dried. Gelatos are amazing for achieving soft “painterly” effects. Just rub them on and then wipe over them with a baby wipe. Lastly some mists and blobs of Color Bloom spray. I love the look of these but I find them to be the least stable, they will still react with other wet mediums even after they have been dried so that’s why I have used it last. The vine used on the hair is a rub-on but I didn’t have very much so had to hand draw some more on the second page using a permanent black pen by Rangerink. This pen writes over everything, which is important when using lots of different layered mediums, which will easily clog up most ink pens. Playing with different mediums and layering them over the top of each other is a lot of fun, many random and unexpected effects can be created. I'd like to show you how I create my layers with fabric and different kinds of lace. 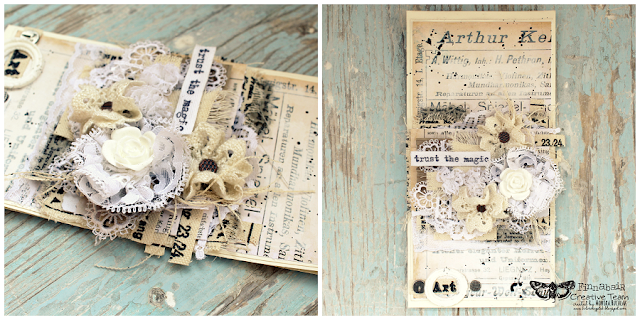 I mostly used Newspaper and Ads resist canvas and the lace from my home stash. I cut the canvas into even stripes, I also cut them here and there and made little tears to make the edges uneven. Some threads that were left over were also used later on iin my composition. 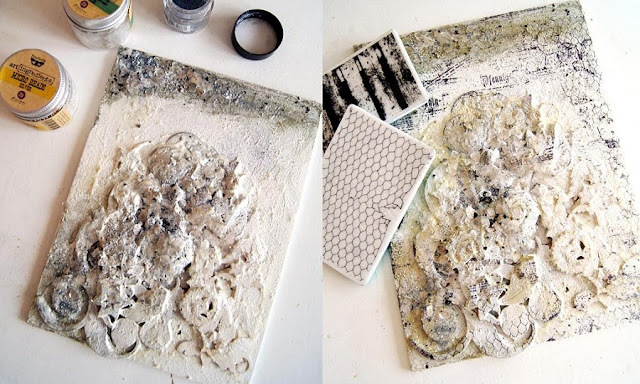 My base was a paper from Vintage Vanity collection covered with a thin layer of White Gesso. Then, it was really simple - I just added a layer of fabric / lace / fabric / lace / and so forth. Sometimes I glued them directly to each other, someties I used a piece of cardboard to create some 'air'. All the layers were glued with 3D Matte Gel. I also decided to create my own simple flowers using lace and Mechanicals mini brads. I also stamped some sentiments from Trust the Magic set onto a cotton ribbon. For my part, I wanted to build a solid and heavy arrangement with dimentional additions. 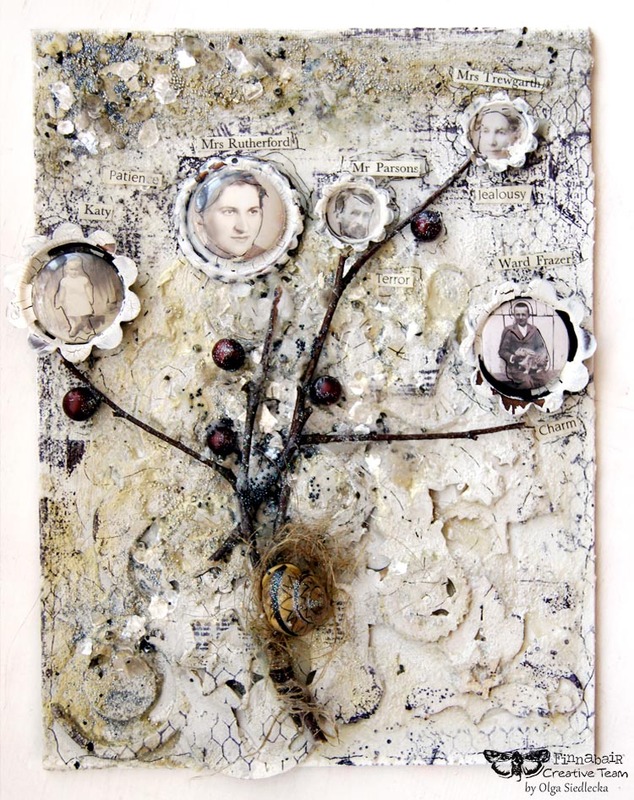 Layering in this case served as the background for the contrastive family tree. 1. I carelessly aranged a composition of chipboards and Mechanicals which I fixed to a canvas panel thanks to 3D Matte Gel. 2. When everything dried up, I put a generous coat of both Texture Pastes with white crackle and white sand finishes. The composition became even and chunky. 3. I added a pinch of Art Sugar and Micro Beads on the wet surface. To my surprise Mica Flakes turned out to be icing on the cake. 4. After slightly misting and drying the whole, I stamped it with various patterns. 5. 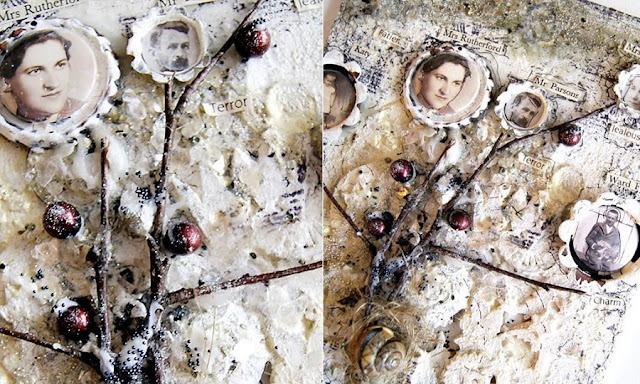 On such prepared background I glued twigs and portraits in Mechanicals frames creating the family tree. 6. The last step consists of labelling the family members, adding beads, a snail shell and more Micro Beads. I also used a black fineliner to accent dimentional elements. Ready! I love layers! I use both dimensional and flat layers in my projects. 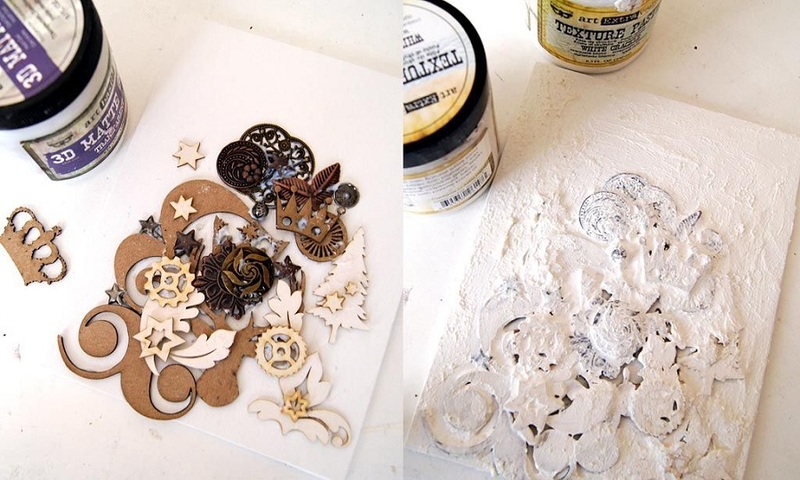 The flat(ter) ones make up the background with stamping, misting and inking and the embellishments and paper layers make the more dimensional ones. My tips on making layers would be: don’t be afraid to cover something, know your supplies and have fun! When building layers, the odds are that you end up covering something you’ve created in a previous stage. That’s why you might want to go a bit bold and big with the first layers so that you end up showing at least part of the things you’ve done. 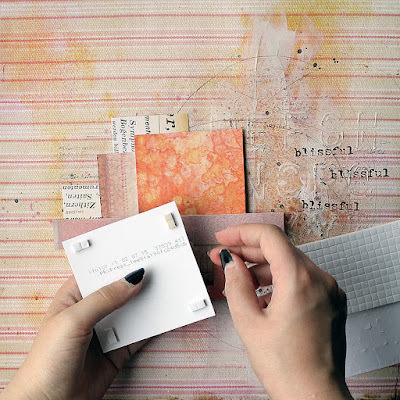 The second tip is connected mostly on stamping in my part but applies to others too. You should know your supplies when building layers. For example I almost always use Archival Ink in stamping because if I then decide to add mist on top the stamped pattern still stays intact. 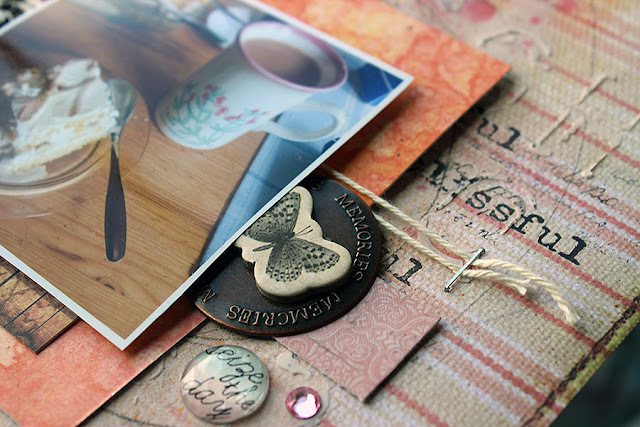 Although bleeding and smudging might look fun too! So you need to know how the mediums react with each other and moisture, too. 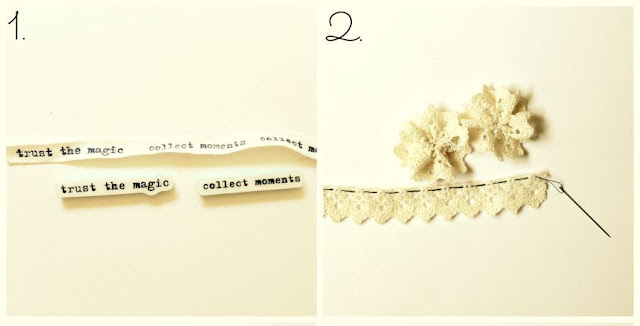 The third tip is just to encourage to play, try out and really - to have fun! 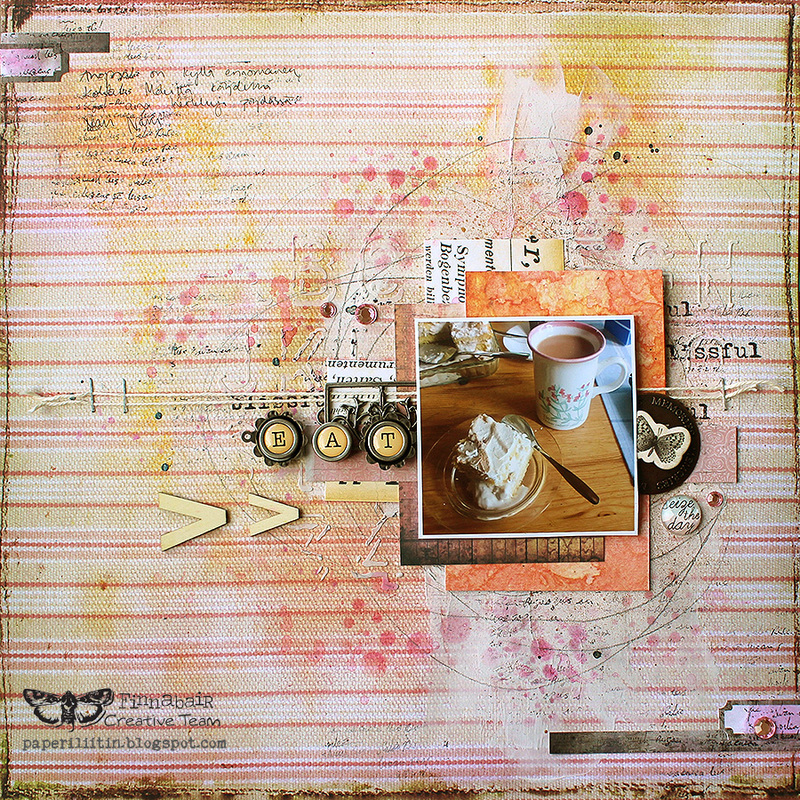 You can create wonderful textures and layers by accident so play with your supplies and try different things. 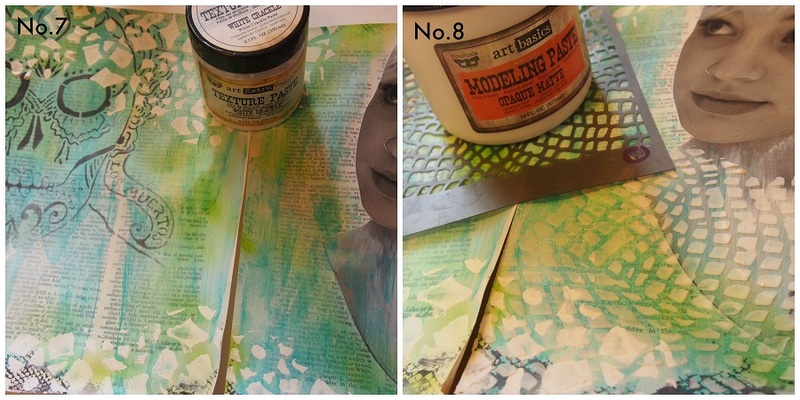 I get asked a lot how I make the paper layers behind the photo so here’s a quick three step tutorial of the process. 1) Make the background layers first by mixing stamping, inking and what you like to use. Then cut some random pieces of patterned paper. Mix different patterns but keep the pieces quite small, biggest piece being the size of the photo or just a touch larger. 2) Then make the composition. Layer the pieces both horizontally and vertically keeping the composition on your hand. 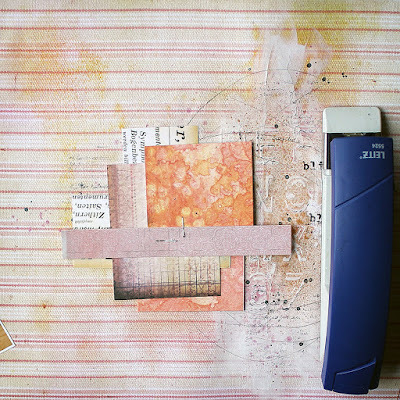 Attach the layers to each other with a stapler. Place the staples so that they are hidden underneath the photo. Use just one or a few if needed. 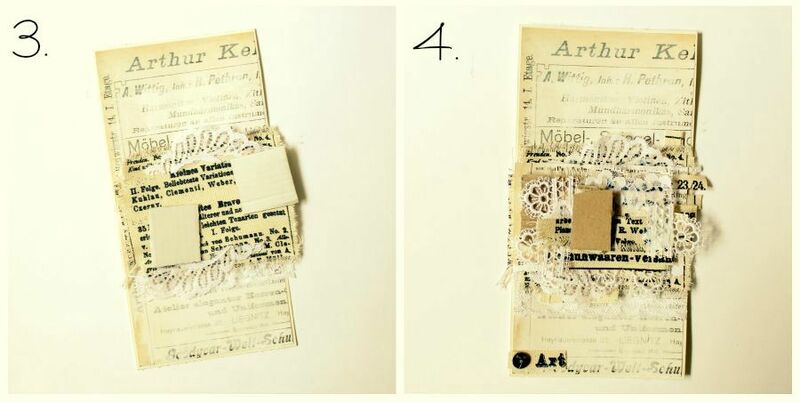 3) Lastly add the photo on top using 3D foam squares. 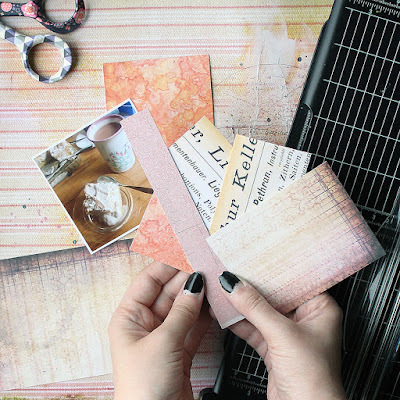 You can also use these to make the paper layers more dimensional, but I often use those just underneath the photo to lift it up from the rest of the page, to really make it pop. We know that some people can't imagine their creations without layers and some others feel totally intimidated by them. In any case, we hope you are feeling inspired and that you will share you artworks with the world in our super friendly Finnabair & Friends Open Studio on facebook. Great tutorials.. So many techniques and variations .Hugs for the team. WOW! Love all of your project ladies and the tutorials! I am absolutely loving SYWA Thank you so much for doing this. 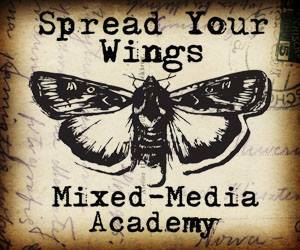 Thank you all for such wonderful layering tips - I love the Academy - I have learned so many useful tips. Thank you all for sharing. This is a fantastic post I'll be sure to play and share!!! Great tips from the designers. Many thanks to all of you. You're the best! Wow, so many different techniques , they are all so awesome. 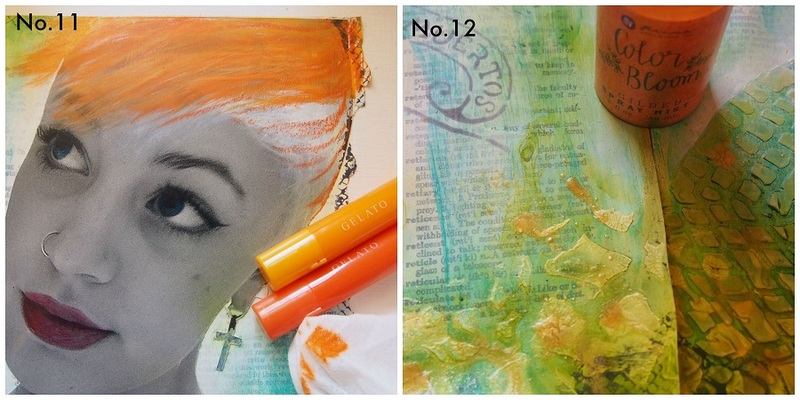 I am just learning Mixed Media, and these pieces shared and showed me so much. Thanks for all the inspiration shared, on the wonderful pieces. Great techniques shown here, Always so inspiring. 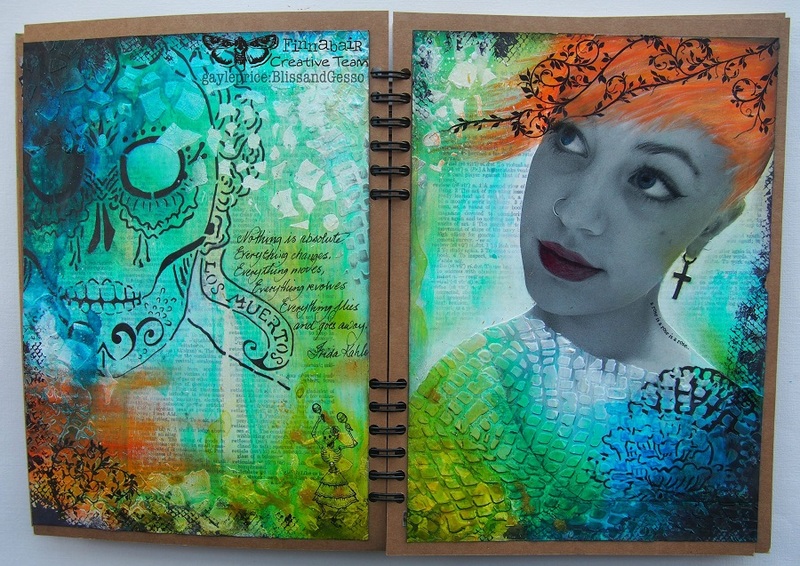 Would love to do such a piece as Olga did, it's amazing!